All-rounder Thisara Perera will replace Upul Tharanga as Sri Lanka’s captain for the ODI series against India, set to be held after the conclusion of the ongoing three-Test series. He will also be the skipper for the three-match T20I series that follows the ODIs. The 28-year-old will address the media on Wednesday at Colombo. Sri Lankan captaincy has been a game of musical chairs lately, with the selectors having looked at a number of options before zeroing in on Perera. Before Perera, Tharanga was the captain during India’s tour to the island nation in July-August, under whose captaincy the Lankan side suffered three 5-0 whitewashes this year itself. Angelo Mathews, one of the most experienced players in the side, had stepped down from captaincy last year, post which the selectors decided to make separate captains for Tests and ODIs. Dinesh Chandimal took over the reins of the Test side, whereas Tharanga took over for the ODIs, with several critics questioning Sanath Jayasuriya (the then selection committee head) in choosing the not-so-vocal Tharanga as the ODI skipper. There were also talks of re-instating Mathews as the ODI captain, but the all-rounder, who has been ruled out from bowling in the ongoing Test series, has had his share of injuries, and always presents the risk of breaking down midway. 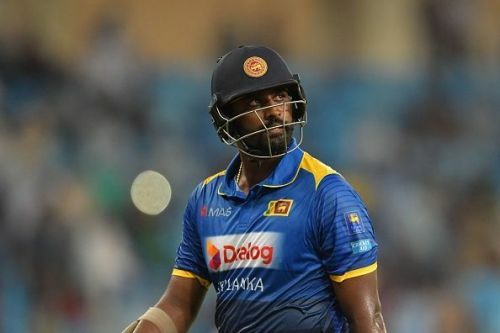 Perera was recently the captain of the T20I side against Pakistan (in October this year), when Upul Tharanga, along with Lasith Malinga, Niroshan Dickwella and Chamara Kapugedera, withdrew from the tour citing security issues.